Psypoke - View topic - The Official Hair Thread! Well, pretty self explanatory. What color/style(? )/length is your hair? Re: The Official Hair Thread! I have brown hair and i like to change the style. My hair goes to the lower part of my shoulders. It's dark brown, is sort of straight at the top but gets curlier the closer you get to the ends. Sorry for the 'mancing, haven't been on in a long time. My hair is bit longer than shoulder length, but is usually styled in the combined effort of my bed and whatever I can throw together in seven minutes. Is this considered necromancy? Anyway, my hair is best described as a medium-length, brown, wavy/curly mini-afro. It looks pretty cool when properly brushed, but in the morning when I get up, it's all over the place and is a pain in the *** to brush down before school starts. My dad keeps saying that the girls love it, but the opinions of a 63-year-old like him might be a little outdated. Anyway, if the girls do like it, they're doing a really good job of hiding it. Get the hell off of my thread! DISPROPORTIONATE HAIR IS MY SIGNATURE!!! NO ONE ELSE CAN HAVE IT BUT ME!!! I'm always called Justin Bieber (so. annoying.) or "that guy from One Direction" but I guess it's kind of a compliment haha. I don't mind what your hair looks like, just so long as you don't break into song and start singing "Baby", I will hate every part of you, hair included. 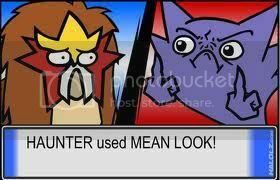 XD I'm just kidding. I don't hate JB that much. 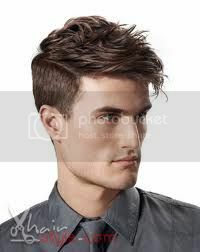 I have this hair style as of now. My hair is wild - not in a Wolverine way (anymore) but rather by constantly shifting, refusing to go in the same direction, and having strands stick up. Basically a medium-short, lanky mess on my head. Eh, it gives me an excuse not to do anything with it. My hair used to be longer than it is now. The back got to around the bottom of my neck and is dark brown. I kinda just left it straight sibce my hair is thick but fine. My hair is cut now and is mostly the same, but it'll grow back quickly, no doubt.